The KRS Law Office in Budapest has advised PortfoLion Regional Private Equity Fund on its investment of EUR 2 million in the Codecool Kft. IT training company. Schoenherr has advised AG Foods Group and Cooperatief Avallon MBO U.A. on settlement of minority shareholders' disputes and on a subsequent management buyout. Jeantet has advised the Mama Shelter hotel chain – a subsidiary of the Accor Group – on the opening of new hotels in Prague and Belgrade. The 2017 CEE Legal Matters General Summit took place at the Intercontinental Hotel in Warsaw on June 1-2, 2017, once again bringing together well over a hundred General Counsel and Heads of Legal from across Central and Eastern Europe for two full days (and one entertaining evening) of seminars, panel discussions, best practices review, and networking. This year’s event — the third annual, following the 2015 GC Summit in Budapest and the 2016 GC Summit in Istanbul — was the biggest and most successful yet. On May 31 and June 1, 2017, CEE Legal Matters was proud to host a rare event: A gathering of those senior lawyers from each Central and Eastern European country identified by peers as being most influential, most important, most uniquely responsible for having created the country’s modern commercial legal market. On April 4, 2017, in a widely reported and highly controversial move, the Hungarian Parliament passed via an expedited procedure a bill, tagged "Lex CEU” by the media, amending the country’s Higher Education Act (Act CCIV of 2011 on National Higher Education). The new act on excise duty has been amended by the Hungarian Parliament on 21 March 2017. According to the amendment initiated by the Economic Committee, the new act will enter into force on 1 July 2017, i.e. 3 months later than originally planned. The Hungarian Parliament has started the general debate concerning the new bill on the mandatory filing of country-by-country report by multinational enterprise groups (MNE Groups) located or operating in the EU. The aim is to hinder the aggressive tax-planning practices of the MNE Groups with a total consolidated revenue equal or higher than €750 million by strengthening the mandatory exchange of information. Increased transparency could have the effect of giving MNE Groups an incentive to abandon the above practices. The Szecsenyi law firm has advised a fund managed by CBRE Global Investors on its sale of the Liget Center in Budapest to M7 Real Estate, acting on behalf of its first Central European fund for third party investors, M7 Central European Real Estate Fund I (M7 CEREF I). Kinstellar advised M7 on the deal. CMS Budapest has represented BlackRock in leasing a 3,500 square meter space at GTC White House, an office building being developed by GTC Hungary and due for completion in Q1 2018. Lakatos, Koves & Partners advised GTC Hungary on the deal. The agreement was concluded with an option to extend the office area up to 7,700 square meters starting in April 2018. Former Weil Gotshal & Manges lawyer Annamaria Csenterics has joined Dentons in Budapest as a Partner. CHSH has advised CA Immo and Union Investment on the sale of the Aerozone logistics center in the suburbs of Budapest to the M7-managed fund, M7 CEREF I.
CMS Budapest has advised the Futureal Group on the sale of the Skypark office building in the center of Budapest and the Sziget Centre shopping mall on the city's outskirts to the OTP Property Investment Fund. Marcell Szonyi in Budapest, Stanislava Valientova in Bratislava, Georgy Pchelintsev in St. Petersburg, and Bartlomiej Kordeczka in Warsaw are among the 54 lawyers worldwide promoted to Partner in the firm's most recent promotion round. DLA Piper has advised the OTP Prime Property Investment Fund on its acquisition of the Skypark office building in Budapest from the Futureal Group. CMS has announced that Budapest-based lawyer Jozsef Varady and Bucharest-based lawyer Horia Draghici have been promoted to the firm's partnership. At the end of March 2017, the Hungarian Ministry of Justice published the bill of the new act on attorneys at law. The bill includes significant amendments compared to the current regulations. 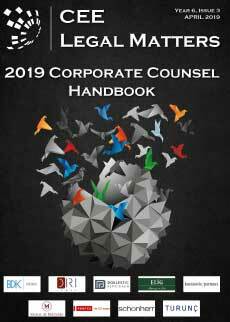 As a main amendment, in house lawyers preparing and countersigning the deeds of the company and acting in court proceedings on behalf of the company would be integrated in the bar association. Since the publication of Regulation No. 2016/679 of the European Parliament and Council on the protection of natural persons with regard to the processing of personal data and on the free movement of such data (GDPR), it is certain that the regulatory framework of data handling and personal data protection will significantly change.